This third in a series of meetings designed to stimulate dialogue on atmospheric aerosols research worldwide among diverse research disciplines was attended by 153 participants from as many as 14 countries. Presentations and discussions took place among researchers from diverse professional backgrounds, all of them possessing varied and distinctive exposure to, and perspectives on, the speciation of organic aerosol compounds. Climatologists, biologists, meteorologists, and analytical chemists shared knowledge with each other, along with students and government agency sponsors. Many came away from the workshop with new knowledge gained by virtue of the workshop's unique approach of grouping researchers of somewhat exclusive, but complementary, disciplines. Organic speciation of atmospheric aerosols was the one thing they had in common. One participant, praising the workshop's success at bringing together such diverse, yet complementary disciplines, said, "as an organic analytical chemist, if I can learn a little bit about how chemicals interact with lung tissue, I may be able to target my techniques to chemicals that are useful to health science and maybe find a few more target compounds." He refers to topic four presentation by Joe Mauderly of the Lovelace Respiratory Research Institute in Albuquerque, New Mexico. For more information about the workshop outcomes, please browse this website. We will be posting powerpoint presentations of about 27 presenters, nearly 40 posters, and summary outcomes of discussions. 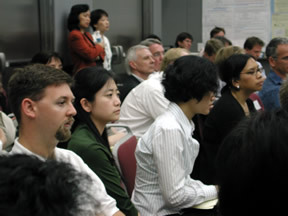 The APACE workshops are planned and conducted by an informal network of researchers, sponsors, support organizations, and individuals working to improve communication on what works, what doesn't work, and where the capacity exists to improve sampling, monitoring, modeling, interlaboratory communication, and bridging the gap between researchers and research sponsors. Look for news on this website about the next workshop to be held in 2005. If you would like to be informed about progress of this workshop or future ones, please email us with your request. Look for the OS Workshop Summary Report fall/winter 2004/05. The Organic Speciation International Worskhop is sponsored by the Western Regional Air Partnership/Western Governors Association. APACE is seeking support from the US Dept. of Energy, US EPA Office of Air Quality Planning and Standards, and the National Science Foundation.